ca 410 - 400 B.C. 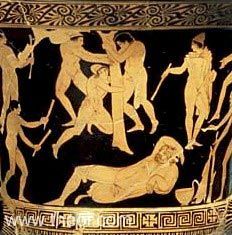 Odysseus and his men prepare to drive a stake the size of a tree-trunk into the eye of the Cyclops Polyphemus. The giant reclines asleep with a drinking cup below his elbow.